PEOPLE HAVE BEEN warned to stay away from the sea until the current bad weather passes as high tides and heavy winds combine to create dangerous conditions. 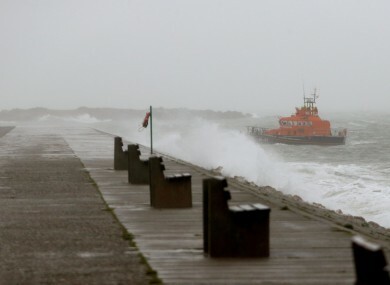 The warning comes from the Coast Guard after one man was injured after being hit by a wave while walking on the pier at Howth in north county Dublin this afternoon. The man was knocked from the higher pier to the lower pier – a drop of 10 feet – by the wave and sustained an ankle injury just before 3pm. As the heavy waves continued to smash across the pier, the man was brought onto an inshore lifeboat and transported the short distance across the harbour to the Howth lifeboat station, where an ambulance was waiting to bring him to hospital. The Irish Coast Guard Rescue Team, Howth RNLI lifeboat, Dublin Fire Brigade, HSE paramedics and Gardáí all responded to the scene. Met Éireann has issued an orange alert weather warning for the country with winds of up to 120 km/h hitting some counties and some coastal flooding. Roads have been closed, some homes and businesses have lost power, and flooding has caused problems in some areas as the stormy weather has hit along the coast. The Coast Guard has appealed to the public to refrain from visiting piers, seafronts and cliffs until the current storm and high tides have passed, and to call emergency services if they see someone in danger. Email “Coast Guard warns people to get away from the sea as man injured at Howth pier”. Feedback on “Coast Guard warns people to get away from the sea as man injured at Howth pier”.